Dostoevsky studied human nature with passion and precision. He plumbed the depths and never winced at what he found, even when it was beyond his understanding. This extraordinary novel is a recital of his findings, told in the story of four brothers: Dimitri, pleasure-seeking, impatient, unruly; Ivan, brilliant and morose; Alyosha, gentle, loving, honest; and the illegitimate Smerdyakov, sly, silent, cruel. What gives this story its dramatic grip is the part these brothers play in their father's murder. The narrator here seems to be working on autopilot. When there is a piece of dialogue followed by something like "he said angrily", you realise that Walter Covell frequently hasn't read ahead. Most of the women's voices sound the same. He leaves hardly any gap at the end of a chapter before giving the title of the next one and moving on. The effect is rather relentless. Characters change voice as the book goes on. I had to keep replaying sections to get the meaning. He's not without expression but doesn't do this great book justice. This is as poor a rendition of a brilliant novel as it has been my misfortune to hear. The narrator seems not to have read the sentences before voicing them, frequently running out of breath before reaching their end. The result is that the ends of phrases seem to be tacked on without rhyme or reason. His struggle with the Russian names is painful, and they seem not to become any more familiar to him as the reading progresses than they were at the start. Added to that, the lack of variety in tone and tempo made the reading sound like a mechanical, text-to-speech machine. Very, very poor. I tried all three narrators available for the unabridged Brothers K. I hated them all to begin with, but Covell is the one that I was able to settle into. Davidson's condescension, though I tried my best to ignore it, was just too much. Woolf and Clovell are both underwhelming, and it takes more concentration to hang on, but between them, I like Covell. In general, I've found boring narrations to be less offending to the ear across a long listening than obnoxious ones that might be more dramatic. Listening to Covell is sometimes like hearing those computer-automated voice, but it can actually become endearing after a while. In any case, while his voice didn't do anything to enhance the reading, in the end he didn't detract from it. I've read the book before, and I found the sensation of hearing Covell's reading exactly the same, whereas Davidson's narration jarred the spell completely for me. It's a shame there is not a reading of this novel as great as Guidall's masterful Crime and Punishment, but this performance still amounts to a wonderful experience. This book is one of the reasons I joined Audible! I loved it! I have read this book a number of times and in different translation but it was great to listen to it while on the road. This is an amazing book and I really felt that listening to it helped me get more out of it. As far as fiction goes, I would rate this #1. I thoroughly enjoyed the mix of drama, psychology, philosophy, religion, law, & Russian History! Have you listened to any of Walter Covell’s other performances before? How does this one compare? I have not. But based on the 40 hours of this recording, I would recommend, and will definitely seek out other recordings by Covell! 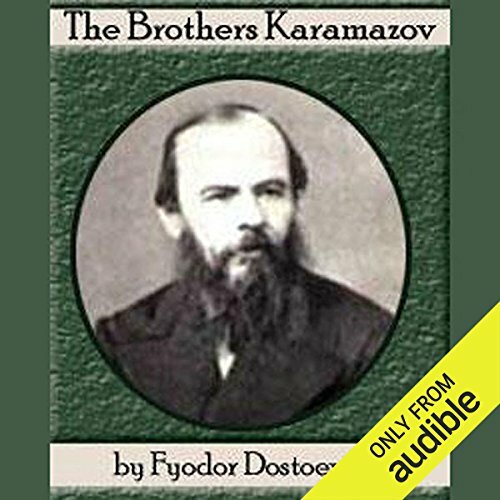 Worth it, even if you're not a fan of "classics"
What made the experience of listening to The Brothers Karamazov the most enjoyable? A well done reading of a story worth hearing. I'm not a huge fan of classic literature, but this story is still relevant and powerful, particularly if you know any sullen young "intellectual" men with chips on their shoulders, or happen to be one. It is a classic story, many know the plot even before they listen, but still, the way the character development unfolds is masterful. Dostoevsky is genius as most of us recognize it. I have listened to it three times. After reading Crime and Punishment I never thought that it could have gotten any better - I was so wrong. The depth, color, span, nuance powerful prose of this book has left me awed by the brilliance of Dostoevsky's genius. Easily among the best I have ever read or listened to. Mr Covell's pronunciation enabled me to either listen and follow along with a book simultaneously, or simply listen alone and still understand everything that was being said. Words were said clearly with no confusion or slurring of phrases. Very well done. Well, Crime and Punishment comes to mind first due to the similar settings, vocabulary, and the fact that they're written by the same author. I enjoy this latter aspect because in C&P we know the killer and root for him being the main character, but in TBK we don't know him and have come to despise him by the time we figure out who the killer truly is. What does Walter Covell bring to the story that you wouldn’t experience if you just read the book? If I had just read the book there would've been portions that would've been skimmed over quickly rather than meticulously studied thanks to the pace of Walter Covell's read. As I followed along with my book, I was able to read with more patience rather than storm through the book, forgetting lines only minutes after reading them. I didn't laugh or cry, but I was amazed at the social attitudes that were prevalent in the historical times of the novel. This was shown immensely during the trial, and I was greatly amazed at the jury's judgement when all that was given by the prosecution was circumstantial evidence. But that's the way courts worked in those times, with just men hearing the story and making decisions - when judges could put forth their opinions and tell the jurors what is true and what is not. Only a couple of times in the narration was a line or a phrase skipped over. This was no doubt due to the same phrases being in back-to-back lines (scribal phenomenon called homoeoteleuton) and the error (called periblepsis) of the omission of the end of the first line as the scribe or orator's eyes returned to the page. Also, a little more emotion in the narrator's voice could always liven the story up a bit, but it is understood how taking on a frantic character's voice could lose verbal clarity which Mr Covell maintained very well throughout.